A Budiriro man threatened to undress before a congregation at Madzibaba Stephen’s shrine demanding his money accusing him of removing his manhood in Chitungwiza last Friday. Kudzai Chihota wrestled with Madzibaba Stephen Mugariri’s aides as he demanded to meet the man of cloth saying he was left with testicles only. The case was taken to St Mary’s police station where he was referred to seek medical attention. Speaking to H-Metro, Kudzai’s mishap came after his intention to ‘centrally lock’ his wife backfired when he was the first to cheat following their visit to Madzibaba Stephen’s shrine. 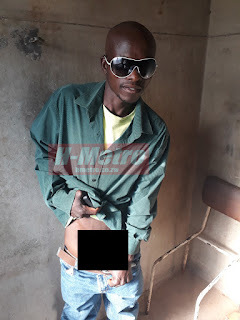 “My brother what I want from Madzibaba Stephen is to restore my manhood or refund my money; it’s not that I want to make noise here since you are free to see that I have testicles only,” said Kudzai showing his private parts. “I am the one who consulted Madzibaba Stephen to lock my wife after I received reports that she was cheating on me. “Madzibaba asked me to visit him along with my wife for the prayers and I didn’t not know that the prayers would affect me as well since I was the one who paid money and asked for help. “My manhood disappeared while I was caressing my girlfriend and I quickly thought of Madzibaba Stephen and I disclosed this to both my girlfriend and my wife. “His aides denied me entry to see Madzibaba Stephen demanding more money since I was not booked for one on one and I decided to lodge a report with police against him. “Police gave me a report to take to a clinic and the nurse could not help me only to write a letter to seek help from well-wishers,” said Kudzai showing H-Metro the said reports. “Yes I know Kudzai after he came seeking for help accusing his wife of infidelity,” said Madzibaba Stephen. “I clearly indicated to him and his wife that the prayers apply to both of them and I want to believe Kudzai wanted to test me. “He must come with his wife not making noise like what he did at the shrine when he is aware of what he did. Iye ndiye munyengeri wemukadzi wake saka akasununguka kunobetserwa nevamwe vaporofita kana n’anga ini ndirikuti ngaadzoke nemukadzi wake chete,” said Madzibaba Stephen. Kudzai claimed that he was feeling pain and not urinating.